Last week, the Marriott St. Louis Grand, presented a check for $10,000 to the area’s CMN Hospitals. The amount represented all the funds raised by the hotel through a variety of fundraisers, including Root Beer Float Day, Miracle Jeans Day and staff appreciation events. The money raised by this hotel directly benefits the children treated at St. Louis Children’s Hospital and SSM Health Cardinal Glennon Children’s Hospital. 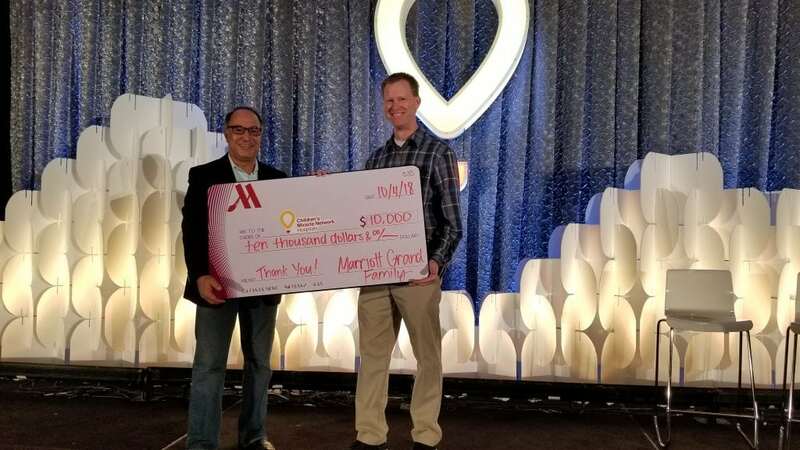 Nour Lassri, general manager, Marriott St. Louis Grand, presented the check at the annual Children’s Miracle Network Hospitals Fall Business Meeting held at the hotel this year. This Marriott property is one of many Marriott properties across the U.S. and Canada that raise money for CMN Hospitals. Since 1983, Marriott International has raised more than $120 million to help sick and injured kids get better.